According to the NFPA, there was one structure fire reported every 63 seconds in 2017. Safely store dangerous chemicals to avoid becoming a statistic. Always store flammable liquids, corrosives, pesticides and other hazardous materials in fire-resistant safety cabinets to meet fire codes and safety regulations. Safety Cabinets Ship Free in the continental USA! 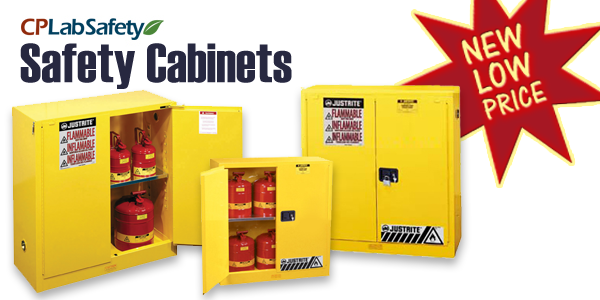 Choose from flammable, acid, and other cabinets. HEMCO 52411 Standard Base Cabinet, 24" x 22" x 35"
HEMCO 54811 Standard Base Cabinet, 48" x 22" x 35"